At the invitation of Mr. Edmund G. Brown Jr., Governor of California, Mr. Ichiro Matsui, Governor of Osaka Prefecture, led an official delegation to visit Sacramento, California on June 11, 2013. 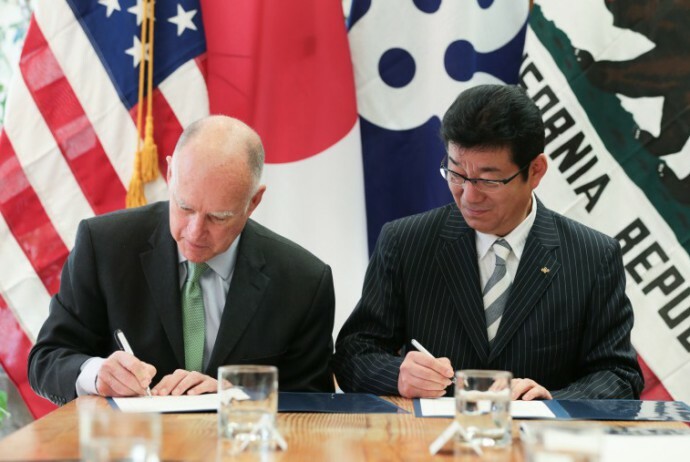 During this visit, Governor Matsui and Governor Brown held friendly talks and reviewed the cooperation between the two sides since the establishment of the sister-state relationship in 1994. Both agreed that Osaka Prefecture and California are economically complementary and that there exists significant potential to advance and strengthen economic and social ties. To support and encourage cooperation on reducing greenhouse gas emissions and promoting low carbon development. To support and encourage their people and governments to further develop interpersonal contacts and exchanges, and to promote mutual understanding and friendship. To promote exchange programs between universities and other educational institutions. That California will designate the Governor’s Office of Business and Economic Development and that Osaka Prefecture will designate the International Affairs Division to coordinate trade and investment relations between Osaka Prefecture and California. This Memorandum of Understanding was signed in Sacramento on June 11th, 2013 in the languages of English and Japanese in duplicate, each party holding one; both texts being equally authentic. Information Source and Photo Credit: Justin Short, Office of the Governor. California and Osaka are both G8x8 territories. The former is ranking first in GDP among US states, placing it at the 1×1 pole position. Osaka ranks second among Japanese prefectures to take the 3×2 field on the board. In 2016, California took a share of 14.1% of the USA total GDP. This was worth $2.6 trillion US Dollars, just as much as the GDP of the United Kingdom (ranking 5th among countries). Osaka posted a GDP share of 7.3 percent of Japan’s national total.